Hi! I am Jonie Lim from Malaysia. In this week 4 assignment, I would like to dive in the noise gate plugin. I have a very simple "studio" setup, a MacBook, itself. I don't have a mic or special room to do recording, thus accoustic noise is my #1 concern in recording. In this blog post, I'll be using one of my previous recordings to demonstrate how to use the noise gate. 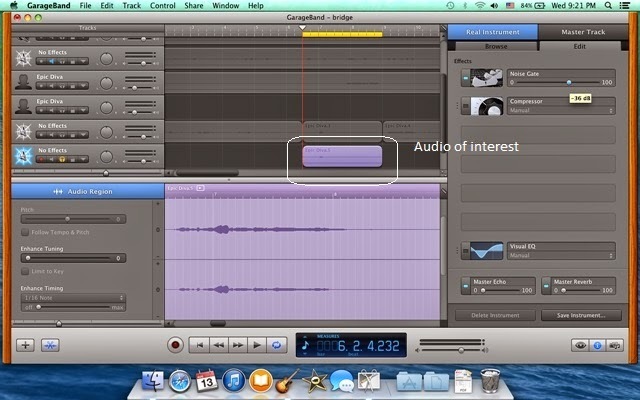 I am using GarageBand 5 for this assignment. 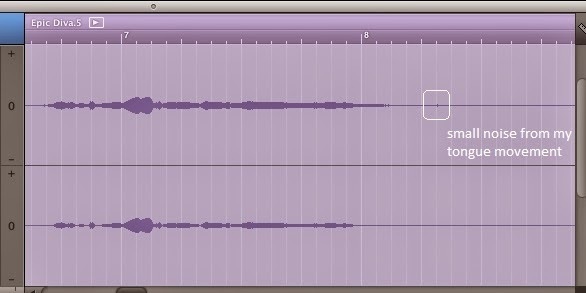 This is the audio waveform from the small purple recording that is splited and copied out from the original recording. To hear the contrast, the effects or plugin that I have put on that track are removed. This is the original recording sounds like. You hear a "click" sound at 0:04 going into 0:05, and also notice the significant noise right after the singing phrase. Look at the audio waveform, the "click" sound is highlighted. 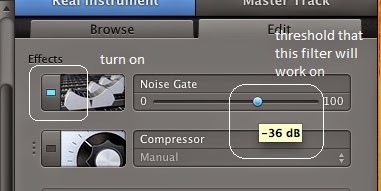 To get rid of the noise and also the unintentional "click" sound, we can use a noise gate plugin to filter them. As we know, our recording sound is normally much louder or has the higher amplitude than the noise. In this case, we can set the noise gate at the threshold where it is higher than the noise, but below the sound of interest, which can be singing or instrument playing. Due to there is no other view in GarageBand 5 to adjust the threshold accordingly, thus this is required to do manually by listening. In this example, I set the threshold to -36dB. Below is the mixed output. OK, that's all for this post. I hope you can hear the difference between the original, untouched recording and also the effect of the noise gate plugin to that recording. Hope you enjoy reading! Cheers!